The highest mountain range between the Alps and the Caucasus. Here you will find rocky peaks covered with snow all year round, sharp ridges, picturesque lakes, waterfalls and valleys that together make this place possibly the most spectacular in Poland. There are about 250 km of trails and a wide range of slopes to satisfy the most demanding of hikers and skiers. A stay in the town of Zakopane at the foot of the mountains is recommended for those who love admiring beautiful landscapes and original folk culture. The Tatras, a part of the Carpathian Mountains, are the youngest in this part of Europe and were formed at the same time as the Alps – as evidenced by their severe rocky shapes. The highest top on the Polish side is Rysy (2 499 m above sea level). The Tatras are home to many animals, including lynxes, eagles, chamois, marmots and brown bears. To protect the local wildlife, all of the mountain area was included in the Tatra National Park and on the UNESCO Biosphere List. The Tatras are situated along Poland’s southern border. They are shared between Poland and Slovakia, the latter containing the majority share. Most of the tourists visiting the Polish Tatras stay in Zakopane, a town of 30,000 at the foot of the mountains. The easiest way to get there is from Krakow, which is only 110 km north of Zakopane. You can drive there by car (it takes about 2 hours), or take a train or a bus (buses are more advisable, as the journey takes less time). Other large cities near Zakopane are Katowice (200 km) and Czestochowa (250 km). 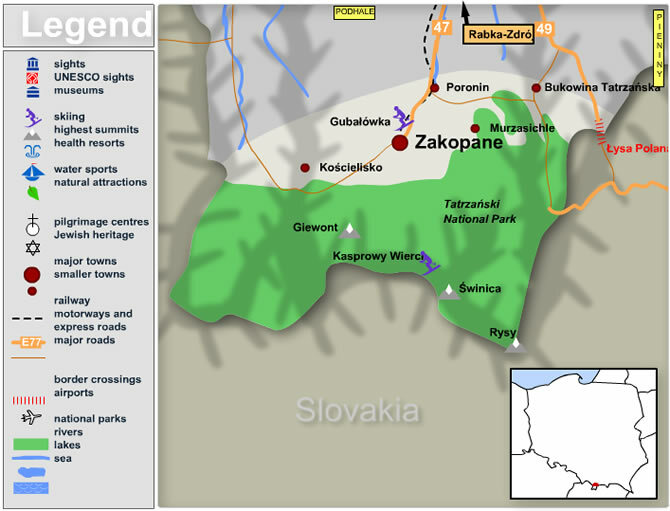 The border crossing with Slovakia in Lysa Polana is only 23 km from the town centre. It provides easy access to famous resorts in Slovakia such as Tatranská Lomnica and Starý Smokovec, as well as the towns of Poprad and Kežmarok. Poland is a country of striking diversity. Browse our catalogue of Poland tours and discover beauty of the country!